Sierra Designs Divine Light 2 FL tent is a 3-season backpacking tent this brand launched in 2017. It is very lightweight, non-freestanding, with three doors, and with some unique features. Mostly a single layer construction. There are many 2-person tents with one door only, some are described in this site, like this Kelty Horizon 2, Big Agnes Fly Creek Platinum 2, and many others. These are great tents, but one door is not always so great, although it may be good enough if it is located in the head section. Well, this is not so in this Sierra Designs Divine 2 FL tent; it comes with 3 doors in total and with a unique design. So, addressing the benefits mentioned above, I wish to stress that with its 3 lb 15 oz (1.79 kg), this is indeed a very lightweight versatile backpacking tool. But this is partly because it is more or less a single-layer tent. Double layers are only on the doors. But not everything is perfect here, this is a non-freestanding tent, and this is also partly behind its weight (or lack thereof), more about this below. This means you have to stake it out and this may be a problem if you are on a rocky terrain, on a frozen ground, sand, concrete, or on gravel. The tent packs nicely to a tube of 14.5 x 6.5 inches (37 x 17 cm), so it can easily be attached to a backpack or transported on a motorbike. The Divine Light FL 2 tent in its full ventilation setup. You have 29.30 square feet (2.72 m²) of the floor area. With the weight of 1.79 kg, this gives the surface-to-weight ratio SW = 1.52 m²/kg. This is very good and you will be able to see how this compares with its competitors in the comparison table below. These numbers are very similar to Big Agnes C Bar 2 Backpacking Tent. But its trail weight is 3 lb 1 oz (1.39 kg), so in this case, you have SW = 1.96 m²/kg. This is quite impressive. Note that in this trail version, the functionality of the tent is not reduced in any sense, more below. You have 3 doors, two on the sides and one in the head area, you can see them in the pictures. They have nets so you effectively have 3 windows as well. The vestibule is only in front of the head door, it can be rolled up in the full ventilation configuration shown in the picture above. The other two doors are with small awnings for the protection of windows, so it is possible to keep them partly open even in the case of rain. The awning setup; here all 3 poles are used and the trekking poles as well. I mentioned the versatility above, so let me say a bit more what this implies. You have two side doors, which you will probably use all the time with your partner. You can use it as a storage area for equipment. You realize it is not in your way, you still have the usual 2 side doors. This is what makes this tent special. This vestibule can be used as a pleasant awning to sit in its shade, you can see it in the picture above. It can be used as an extra covered space for your dog. The vestibule gives you 10.30 ft² (0.96 m²) of extra space which is a true storage area, not in your way as in the case of ordinary vestibules that tents normally have in front of the entrance doors. 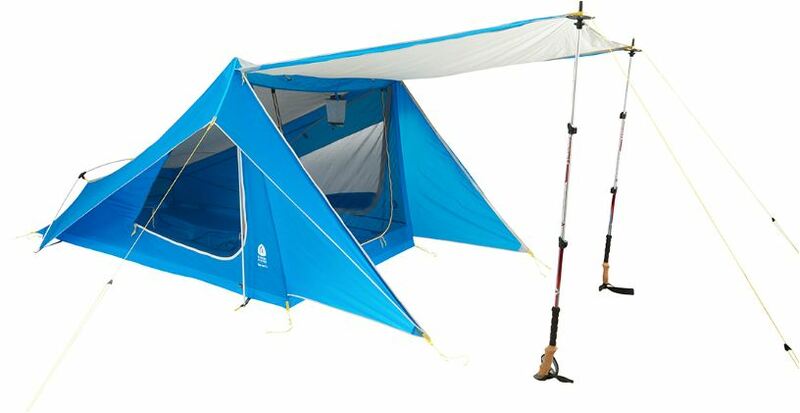 You can use this tent without its two vertical poles. Instead, you can use your trekking poles to pitch the tent, this is the trail weight which is mentioned above. Full rain protection setup, the first picture in the text above. This means the vestibule is closed and used as a storage area. Awning configuration setup shown in the picture above. There are 2 vertical DAC NSL aluminum poles and a DAC Pressfit hoop at the rear. The height is determined by the two vertical poles, and you also have inverted configuration here. This means that the tent is wider on the top than in the floor area so you have a lot of volume inside. 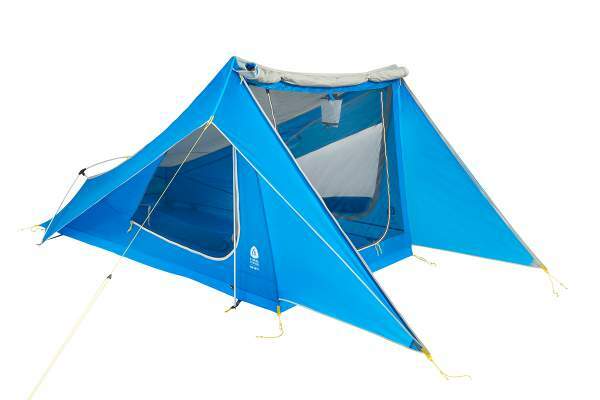 To shed the weight, you can use the tent without vertical poles and this is the part of its versatility. Use your trekking poles instead. This tent could be described as a hybrid type but this is not completely so. Indeed, you do not have the usual inner mesh tent. This is a single layer construction, with extra layers only on the doors (and you have them many as you see). Such a single layer construction is both good and bad. The good thing about this is that when you are setting the tent in rain, it is protected all the time. 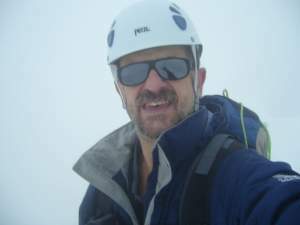 I have had such unpleasant situations in the Alps, one is mentioned in my tour to Similaun. My tent was a double layer type and everything became soaked with water, so I had to give up and continued walking and spent the night in the Similaun hut. This single layer Divine FL 2 tent is also lighter because of this design, and such a construction is easier to setup in general. But double layer tents are more pleasant and warmer in general and they behave better with respect to condensation. 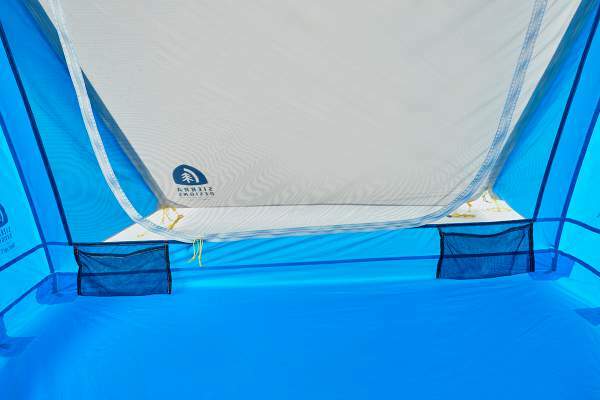 However, this tent has openings on all 4 sides, so the air flow is optimal and the condensation should be minimal. The storage pockets in the head section, and the closed vestibule behind. The fabric (the fly and the walls) is 20D nylon ripstop with silicon, and with 1500 mm waterproofness rating. The floor is 30D nylon ripstop, WR, and with 3000 mm waterproofness. All the seams are factory sealed. So as you realize, this is partly behind the weight, the materials are rather tiny. Such a waterproofness rating is quite normal for such a 3-season tent, and it is slightly better from the numbers in some winter tents, like this MSR Access 2 tent. You get the following: the tent, 3 poles, 11 stakes, four guylines, Night Glow accessory diffuser, tent stuff sack, stake and pole stuff sack. Being a non-freestanding tent, you start by staking out the corners. After that put the tip of the poles into the grommets and extend the poles into the apex of the awnings. Then stake out the side awnings guylines. Clip the rear arched pole into the footbox of the tent and stake out the rear guyline. Check all guylines and adjust if necessary, and the tent is ready. This is a great tent for backpackers and hikers. It is less suitable for mountaineers for use far above the tree line where you can expect mainly rock. In view of its price, it may not be the best option for beginners. If you are one of them or you need a tent for a beginner or for occasional use only, have a look at my separate page, there are many far less expensive tents available, like this Coleman Sundome 2 tent. Minimum weight: 3 lb 1 oz (1.39 kg) – this is without 6 oz. vertical poles. Packaged weight: 3 lb 15 oz (1.79 kg). Vestibule area: 10.30 ft² (0.96 m²). Floor area: 29.30 ft² (2.72 m²). Peak height: 45.5 in (115.6 cm). Dimensions (L x W): 88 x 50 at head / 46 at foot (224 x 127 cm head / 117 cm foot). Packed size (L x W): 14.5 x 6.5 in (37 x 17 cm). Poles: 3 (2 vertical poles, 1 foot box pole). – Poles: DAC NSL / DAC Pressfit. – Fly: 20D Nylon Ripstop, Silicon, 1500 mm PE, FR CPAI84. – Floor: 30D Nylon Ripstop, WR, 3000 mm PE, FR CPAI84. – Body: 15D Nylon No-See-Um Mesh. Wider ceiling than the floor. Out of the way gear storage. J-shaped door with waterproof window panel. 10 inches awning coverage over side doors. Reflective guylines and guyout loops. Clearly, the price is the main reason behind my relatively low mean rating value. *Note, this is the packed weight which includes the footprint as well. The vestibule in the Divine tent looks small, but bear in mind this is a single space, while the other two have two vestibules, but more importantly, those two are in front of the entrance doors so they provide less effective storage area than the single vestibule in the Divine tent. At the moment of writing this text, the prices of the tents are, respectively, $250, 126, 350. So the Sierra Designs tent is expensive but it has quite remarkable features and it offers a lot of comfort. In the conclusion of this Sierra Designs Divine Light 2 FL tent review to stress again that this is an inverted space design with a wider ceiling than the floor. This brand is known for this feature used in several of their tents. It adds a lot of volume, and it elevates the livable space. The awnings on all sides allow for keeping the windows and the ventilation elements open so you can have views around all the time, even when it is raining. I trust this brand and I can fully recommend this tent. It is expensive and not perfect, but it is very reliable and with unique features. As a tent for two people, it has three doors, which add to its functionality. The vestibule area is so large that I am convinced it can serve as a proper shelter for a dog if you have it with you on the trail. In the rating breakdown, you can see my lowest rate is for the price, and for the features. The latter is only because it is not freestanding, otherwise, this tent is full of great features. Note that they have a solo version as well, presented in my separate text, so please have a look. If you need something different, please see this text with an impressive list of great tents for 2 people. If this tent is not what you want, you might want to check this Mountainsmith Morrison Evo 2 tent or the iconic Sierra Designs Clip Flashlight 2 which is only half the price of the tent presented above. Thank you for reading. Please use the comment box below in the case of any question, and let me know what you think. I wish you a pleasant day. Light those tents with roadeavour lantern. They come equipped with their own lantern, so you use the headlamp which you normally have, so no need for extras.